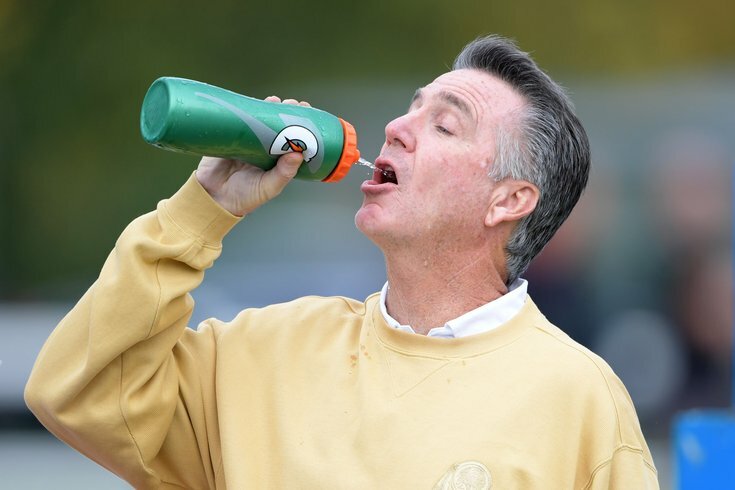 Bruce Allen takes a hard-earned water break after a long day of manipulating Dan Snyder. This week, all week long, we're taking a brutal look at each of the teams in the NFC East, in detail. The first target on Monday was the mired-in-mediocrity Dallas Cowboys. On Tuesday, we roasted the garbage Giants. Today we'll tackle the always dysfunctional Washington Redskins. That's what it says on Bruce Allen's bio in big, bold letters on the Redskins' website. Allen was hired to be the Redskins' GM at the tail end of the 2009 season, and he has been the head personnel decision maker ever since, save for the short tenure of Scot McCloughan, who Allen helped oust after two season (2015-2016) with the team. In Allen's eight full seasons with the team, the Redskins' record is 52-75-1. That would be a winning percentage of 0.410. On the "bumbling moron" front, Allen doesn't even know Kirk Cousins' name. I mean, it's not like he just misspoke, or got tongue-tied or something. He called him "Kurt" SIX TIMES, lol. Cousins ultimately bolted in free agency, for nothing more than a likely future compensatory pick in between the third and fourth rounds of the 2019 NFL Draft, after the Redskins botched his contract negotiations for years. On the "snake" front, McCloughan referred to Allen as a "politician" when asked to describe him in one word. The Redskins were also voted one of the five least prepared teams in contract negotiations. If the Redskins have a good season, then fans will undoubtedly be happy. Of course, that just means that Allen will continue to keep his job beyond all reason, when he should have been gone a long time ago. In a rather surprising move the week of the Super Bowl, Allen traded for quarterback Alex Smith, giving up a third-round pick and cornerback Kendall Fuller in the process, thus ending the 'Kurt' Cousins era in D.C. The Redskins were in a terrible situation with Cousins' contract, as they had franchise tagged him in each of the last two seasons. Had they franchise tagged him a third time, they would have owed him $34.5 million in 2018. • Rodney Peete, 1999 (Traded to Redskins for a 6th-round pick): Peete played in three games for the Redskins. He had 17 pass attempts before moving on to Oakland the following year. • Bobby Hoying, 1999 (Traded to Raiders for a 6th-round pick): Hoying had seven pass attempts for Oakland over two years before he retired in 2001. • A.J. Feeley, 2004 (Traded to the Dolphins for a 2nd-round pick in 2005): Feeley saw action in just 11 games in Miami, posting a horrendous 61.7 QB rating. Midway through the 2005 season, the Dolphins traded Feeley to the San Diego Chargers for Cleo Lemon. • Kelly Holcomb, 2007 (Traded to the Vikings for a 6th-round pick in 2009): Holcomb played in three games for the Vikings in 2007, posting a 73.1 QB rating. He retired the following offseason. • Donovan McNabb, 2010 (Traded to the Redskins for a 2nd-round pick in 2010 and a 4th-round pick in 2011): McNabb played one year in Washington, posting a QB rating of 77.1. He was demoted to the third-string by Mike Shanahan before the Redskins shipped him off to the Minnesota Vikings for a sixth-round pick the following offseason. • Kevin Kolb, 2011 (Traded to the Cardinals for a 2nd-round pick and Dominique Rodgers-Cromartie): Kolb ended up starting just 14 games for Arizona, posting a QB rating of 83.2 in two years there. He suffered a myriad of injuries, including turf toe, a concussion, and a rib injury, before the team asked him to take a pay cut. When the Cardinals and Kolb could not come to an agreement on a restructured deal, they cut him. In 2010, the McNabb trade (McNabb was 33 at the time) blew up on the Redskins spectacularly. Eight years later, they not only traded with Reid for another 33-year quarterback in Smith, they also handed him a contract extension worth more than $70 million in guaranteed money. Smith had good numbers in 2017, and he's better than Cousins, in my opinion, but there's perhaps some logic in the notion that a mobile quarterback with below-average arm strength may not age well. Smith turned 34 in May. Clearly, the Redskins felt that they were not in a good enough position to select one of the better quarterback prospects in the 2018 NFL Draft at 13th overall. And, well, they were right, as four went in the first 10 picks. By contrast, the Philadelphia Eagles were originally drafting 13th overall in 2016, when they made a pair of deals to put themselves in position to draft Carson Wentz second overall. The Rams made a similar bold move to go get Jared Goff, and both teams are now poised to be perennial contenders for the foreseeable future. Anyway, Smith may very well be a modest short-term upgrade over Cousins, but this is a Redskins team that doesn't look like a Super Bowl contender anytime soon, especially in an absolutely loaded NFC. Handing out $70-plus million in guaranteed money along with forking over a third-round pick and a good player for Smith's services is a move I might make if I were running a team with a great roster, but a big hole at quarterback. This feels a lot like a move by a GM/coach combo that is running out of time to start winning games. Ultimately, however, it should keep them in that mediocre zone that they are so used to. 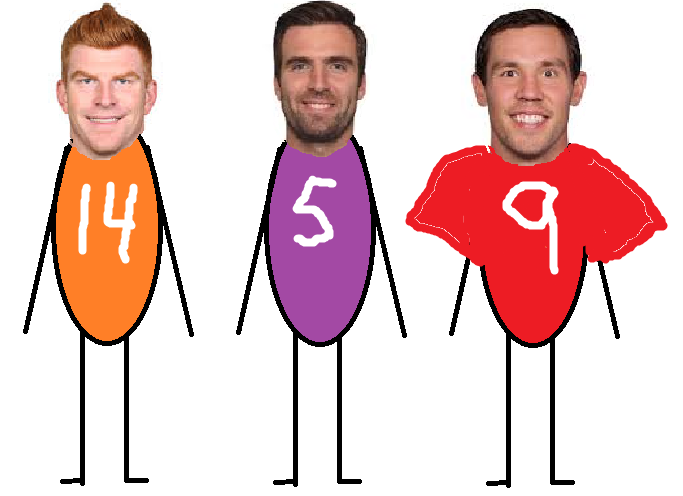 There are teams that can match the number of quarterbacks the Redskins have started over that span, but perhaps only the Browns can match their collective awfulness. And yet, one of the weirdest things about the Redskins' quarterback situation is that despite having a clear need for a franchise quarterback for almost 20 years, they have only drafted one (RG3) in the top half of the first round during the Snyder era. They have a long history of acquiring veteran quarterbacks that other teams don't want, and somehow they think the result will be different after 20 years of trying this approach. It's fascinating. Who will be the next Band Aid the Redskins trade for in three years? Last offseason, the Redskins swung and missed, hard, when they signed WR Terrelle Pryor to a one-year contract worth $6 million. At the time, that deal looked like a bargain. The hope was that Pryor could help offset the losses of Pierre Garcon and DeSean Jackson, a pair of 1,000-yard receivers in 2016, but Pryor stunk out loud, catching just 20 passes for 240 yards and 1 TD. This season, the Redskins swung hard again, signing former Seahawks WR Paul Richardson. In four seasons in Seattle, Richardson had 93 catches for 1,302 yards and 8 TDs. He had his best season in 2017, when he had 44 catches for 703 yards and 6 TDs. Richardson is a speedy, field-stretching wide receiver who should fit in well into the Redskins’ offense, but the cost was a five-year contract worth $40 million ($20 million guaranteed). What?!? When the Redskins lost Jackson’s ability to stretch opposing defenses, their offense took a hit, and their pursuit of a suitable replacement is understandable. However, paying a wide receiver $8 million per season with Richardson's track record is laughable. On the other side of the field will be third-year pro Josh Doctson, the Redskins' first round pick in 2016. Through two seasons, Doctson has 37 catches on 84 targets, for a horrendous 44 percent catch rate. Recent history of first round receivers says that Doctson is much more likely to continue to be ineffective than he is to suddenly start lighting up the stat sheet. Doctson has 568 receiving yards in his short NFL career. The following is a list of wide receivers selected in the first round of the draft since 2000 who had less than 850 receiving yards their first two years. (We'll use 850 so that we can get an extra success story in there, in the Broncos' Demaryius Thomas). In case a simple eye-balling of the above list isn't sufficient enough for the point I'm making, here's what the above players did the rest of their careers after their slow first two year starts. • Travis Taylor, Ravens: Played five more seasons in the NFL, averaging 41 catches for 530 yards and 3 TDs per season. • Sylvester Morris, Chiefs: Nothing. Morris never played in the NFL again. • R. Jay Soward, Jaguars: Nothing. Soward never played in the NFL again. • David Terrell, Bears: Terrell played three more years in the league, catching 85 passes for 1,060 yards, and 2 TDs. • Santana Moss, Jets: Moss had a long, productive career, mostly with the Redskins, catching 700 passes for 9,810 yards and 62 TDs over the rest of his career. • Freddie Mitchell, Eagles: Mitchell played two more years, catching 57 passes for 875 yards and 4 TDs. • Charles Rogers, Lions: Rogers played one more season, catching 14 passes for 197 yards and 1 TD. • Reggie Williams, Jaguars: Williams played three more seasons, catching 127 passes for 1,609 yards and 17 TDs. • Michael Jenkins, Falcons: Jenkins caught 311 passes for 3,800 yards and 22 TDs over the rest of his seven seasons, mostly as a forgettable No. 2 receiver. • Rashaun Woods, 49ers: Nothing. Woods never played in the NFL again. • Troy Williamson, Vikings: Williamson played three more seasons, catching 26 passes for 304 yards and 2 TDs. • Mike Williams, Lions: Williams played three more seasons, catching 90 passes for 1,077 yards and 3 TDs. • Craig Davis, Chargers: Davis played two more seasons, catching 27 passes for 311 yards and 1 TD. • Darrius Heyward-Bey, Raiders: DHB had a good third season, catching 64 passes for 975 yards and 4 TDs. Over the rest of his career since, he has averaged 17 catches for 237 yards and 2 TDs per season. He is somehow still in the league. • Demaryius Thomas, Broncos: In each of his next five seasons, Thomas surpassed 1,000 yards, averaging 98 catches, 1,374 yards and 9 TDs per season, before having that string snapped in 2017. • Jonathan Baldwin, Chiefs: Baldwin played one more season, catching three passes for 28 yards and no TDs. • A.J. Jenkins, 49ers: Jenkins played one more season, catching nine passes for 93 yards and no TDs. • Tavon Austin, Rams: In his next two seasons, Austin caught 123 passes for 1,029 yards and 8 TDs. The Rams traded him to the Cowboys for a sixth round pick. • Kevin White, Bears: White's career has been destroyed by injuries so far. In his third season with the Bears, he had two catches in one game. He's on his last chance in Chicago this year. • Nelson Agholor, Eagles: Agholor's first two seasons were filled with egregious drops and mental errors. In year three after a move to the slot, he figured things out, catching 62 passes for 768 yards and 8 TDs. • Breshad Perriman, Ravens: Perriman missed his rookie season, and has shown bad hands in the two seasons thereafter. He might not make the Ravens' roster this year. • Phillip Dorsett, Colts: In his third season, Dorsett was traded to the Patriots. He had 12 catches and no TDs in 2017. Can Doctson buck the trend? Maybe, but it's more likely he'll continue to disappoint. 5) Is Jordan Reed done? Reed has suffered SIX concussions in his football career, and he has not played all 16 games in any season, missing 28 games in six years in the pros. While he stayed concussion-free in 2017, he missed 10 games due to toe and hamstring injuries. Reed had a great season in 2015, when he had 87 catches for 952 yards and 11 TDs. He looked like one of the best tight ends in the league. The Redskins would probably love to build their passing attack around him, seeing as he's clearly their most talented receiver. Unfortunately for the Redskins, they can't trust that he'll be available from week to week. Of the Cowboys, Giants, and Redskins, it was hardest to come up with 10 good reasons why the Redskins won't be good this year. In other words, in my view, they have the fewest glaring holes in the division, you know, aside from the Eagles. The downside? They don't really have any major impact players either. Trent Williams is a great left tackle, although great left tackles are a dime a dozen in the NFC East. On defense, Ryan Kerrigan is a really, really good player who is worthy of his three Pro Bowl nods. He'll get his 10-12 sacks and three forced fumbles every year, and there isn't a team in the league that wouldn't want to have him. He's the kind of guy who will kill a rookie making his first appearance in the NFL, like he did to Halapoulivaati Vaitai in 2016 or Adam Bisnowaty in 2017, but those dominant performances aren't there as much against legitimate pro players with experience. And then there's Josh Norman, who is a good starting corner in the NFL, but far from the star player the Redskins paid him to be. Each of the three other NFC East teams have legitimate star players. Because the Redskins don't, their ceiling is probably capped at "good," not "great." As we noted in the Cowboys' dumpster fire piece, building an offense around the run game is dumb in today's NFL, as teams who know the run coming and still can't stop it are few and far between. The Redskins are one of those teams, and until they get that fixed, the Cowboys are going to be a bad matchup for them twice per season. Three rushes of 20-plus yards is horrendous. It's the fewest number of rushes of 20-plus yards since the Cincinnati Bengals had three in 2010. The Redskins will be better running the football in 2018. There's no doubt about that, seeing as it's an extraordinarily low bar to clear. Plus, in theory, they'll be healthier along their OL, though they still have holes there, particularly at LG and C. To be determined if/when Derrius Guice will prove NFL decision makers right or wrong about his drastic slide during the 2018 NFL Draft. Still, improved or not, you'd prefer the rushing offense to be less awful than they were in 2017, and I'm not so sure that a few healthier bodies are going to suddenly vault them into some rushing powerhouse. 9) The Redskins have one good corner, and then? The Redskins' corners last year were Norman and Bashaud Breeland, with Fuller in the slot. Breeland was set to join the Carolina Panthers in free agency this offseason, but he failed his physical and remains unemployed. Fuller, as noted above, was shipped off to Kansas City in the trade for Smith. Fuller had a breakout season in 2017. Breeland and Fuller won't be easily replaced. Yes, yes, I know, Breeland remains unemployed, but that's more a result of his health, and not his play, which was solid last season. The team likes Dunbar, and early OTA reports suggest he is playing well. But it's far from a guarantee that he's an upgrade over Breeland. 2014: Suspended four games for PEDs, with the suspension later being lifted because his use of amphetamines counted under the substance abuse policy (not the PED policy), where it would take multiple offenses to be suspended. Anyway, he ended up missing two games before that suspension was lifted. 2015: Missed the entire season with a torn ACL. 2016: Appeared on the injury report eight games with foot and hamstring injuries, missing four games. 2017: Missed a game early in the season with a hand injury, then missed four games during the stretch run with a back injury, eventually landing on IR. In my view, the Redskins got worse overall at corner this offseason. 10) And as always, let me check to see if Dan Snyder is still the owner.